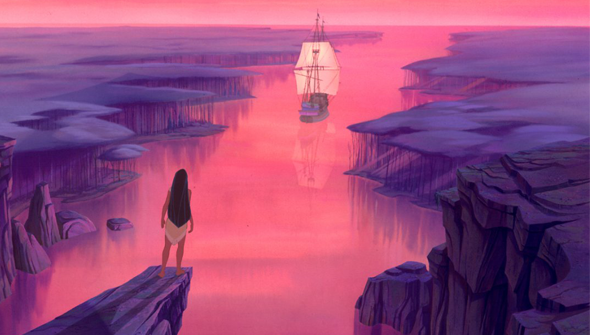 Of all the films from the Disney Renaissance of the 1980s-1990s, Pocahontas is perhaps the most controversial. A fictionalized retelling of the founding of Jamestown Colony (the first permanent English settlement in the Americas), the story focuses on the first encounters between members of the Native American Powhatan community and the English settlers. By this time, most of our readers have probably heard about the controversies surrounding this movie (if not, this wikipedia article does a good job of touching on the basics). In true Disney style, many of the problematic aspects of early English colonialism are ignored. The film features some truly stereotypical representations of Native Americans, and misrepresents Native forms of spirituality. It is also quite frequently racist. And yet, I argue that this movie provides several important discussions that are hard to find in other parts of the Disney corpus. First, "Pocahontas" encourages the viewer to do what she wants to do, not what everyone else wants her to do. Like other Disney princesses (Merida, Ariel), Pocahontas finds that, in order to follow what she knows is right, she must go against her father and her society. Importantly, she does this not just to save her love interest; she wants to stop a war that will be extremely damaging for both her community and the English. This demonstrates that following your heart is essential in every aspect of life, not just in your intimate relationships. At the end of the movie, Pocahontas is again accepted by the community and by her father, thus demonstrating that, even if you have a disagreement, you can still go home afterwards. 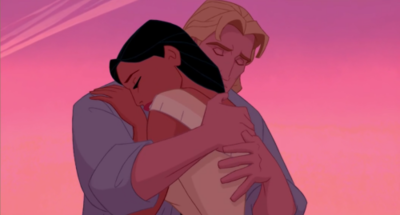 This is also the first Disney movie to feature an interracial relationship (shortly followed by Esmeralda and Phoebus from 1996's "The Hunchback of Notre Dame"). Even today, it is rare to see an interracial relationship between two animated characters, although this is hopefully changing with the increase in multiracial families (as seen in the 2014 movie "Big Hero 6"). Second, this movie emphasizes the difference between exploiting and using natural resources. And, more importantly, it critiques colonialism and capitalism for the way they destroyed the natural environment. "Wiggins, why do you think those insolent savages attacked us?" "Because we invaded their land and cut down their trees and dug up their earth?" "It's the gold! They have it, and they don't want us to take it from them!" Radcliffe, in his blind search for gold, is willing to destroy the natural environment of this Virginia coast within moments of arriving. He has no desire to conserve resources for later; what happens to this area in the future is of no concern to him. The Powhatans, on the other hand, have been living here for many years. They have a vested interest in maintaining the fertility of the land. In a nutshell, these scenes of natural destruction demonstrate the effects of the colonial powers' scramble to appropriate natural resources all over the world, particularly in places considered "backward" and "inferior." For children and adults both, this is an important lesson to see, especially if you can connect it with present events. This is made especially clear by John Smith's changing attitude toward the land and people over the course of the movie. Last, and most importantly, this movie provides an example of cultural contact between two very different groups. The English and the Powhatans have different lives, different worldviews, different interests and ways of living. What do they share? Both sides decide that fighting is better than trying to understand the other. As Radcliffe sings, "They're not like you and me, which means they must be evil," echoed by the Powhatan's medicine man, "They're different from us, which means they can't be trusted." 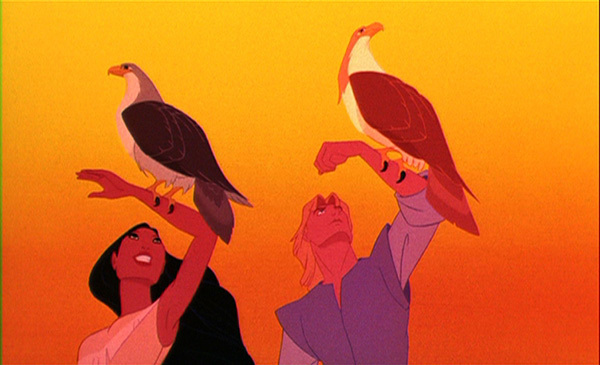 The only two people who are not quite willing to go along with this interpretation are Pocahontas and John Smith. John, a jaded explorer, is particularly impressed and invigorated by this new land, which seems full of adventure. Pocahontas, in typical Disney main character fashion, is a curious and open-minded teenager. When they meet, they have an instant rapport, helped by a little Disney Magic™. Not only are they willing to talk to each other, they are curious to find out more about these strangers. When John calls Pocahontas a savage, she quite reasonably becomes upset. But, in an example of how to handle these situations, this sparks off a real conversation. John proves to be open-minded enough to really listen to what Pocahontas is saying, which results in his changing attitude over the course of the movie. From considering the Powhatans to be savages, he comes to value and respect them as people whose way of life is superior to that of the English in some ways. 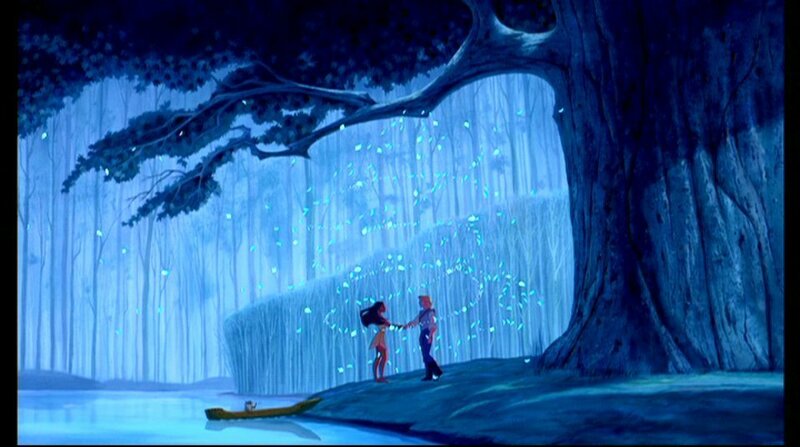 And, of course, he and Pocahontas fall in love, but that is not really the point. In the end, both of them are willing to risk their own lives in the attempt to stop a war. Apart from these considerations about the story, the visual animation and music are stunning. The stylized forest filled with straight trees, underwater scenes, and leaves caught in the magical wind are definite highlights of the beautiful animation in this Disney musical. Overall, Pocahontas is not one of Disney's best movies. But it does provide room for discussion and learning opportunities for both kids and adults.